Traditional Chinese Medicine (TCM) covers many different medicine practices and processes. It is based on Taoism and the practice is more than 2,000 years old. TCM's varied medicine practices share common theoretical concepts which have been developed in China and are based on a tradition of more than 2,000 years, including various forms of herbal medicine, acupuncture, massage (Tui na), exercise (qigong), and dietary therapy. Although considered as an alternative medical practice in the western world, traditional chinese medicine is a common part of medical care throughout East Asia. There are about 13,000 medicinals used in China and over 100,000 medicinal recipes recorded in their ancient literature. Plant elements and extracts are the most common elements used. In the classic Handbook of Traditional Drugs from 1941, 517 drugs were listed - out of these, 45 were animal parts, and 30 were minerals. 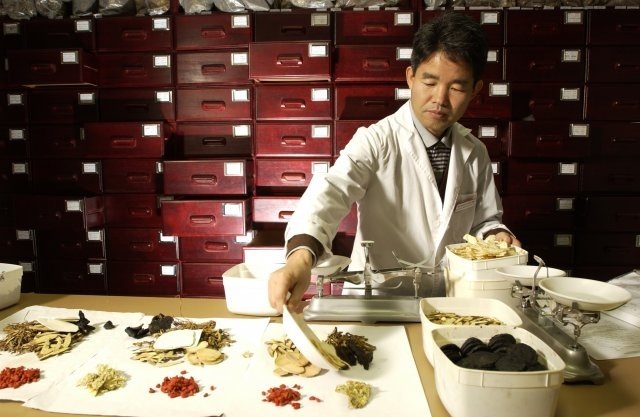 Researchers at Murdoch University have used new DNA sequencing technology to reveal the animal and plant composition of traditional Chinese medicines (TCMs). Some of the TCM samples tested contained potentially toxic plant ingredients, allergens, and traces of endangered animals. "TCMs have a long cultural history, but today consumers need to be aware of the legal and health safety issues before adopting them as a treatment option," Dr Bunce, research leader and Murdoch University Australian Research Council Future Fellow, said. The 15 TCM samples, seized by Australian border officials, in the form of powders, tablets, capsules, flakes, and herbal teas were audited using the DNA preserved in the samples. The results are published in the journal PLoS Genetics. Video: What is Traditional Chinese Medicine? "In total we found 68 different plant families in the medicines – they are complex mixtures of species," Dr Bunce said. "Some of the TCMs contained plants of the genus Ephedra and Asarum. These plants contain chemicals that can be toxic if the wrong dosage is taken, but none of them actually listed concentrations on the packaging." "We also found traces from trade restricted animals that are classified as vulnerable, endangered, or critically endangered, including the Asiatic black bear and Saiga antelope." Until now it has been difficult to determine the biological origins of ingredients contained within TCMs because processing into pills and powders makes identification difficult. PhD student Megan Coghlan, who is studying the application of DNA techniques in wildlife forensic applications, said the research shows that second-generation, high throughput sequencing is an efficient and cost-effective way to audit the species composition. "The approach has the ability to unravel complex mixtures of plant and animal products," Ms Coghlan said. Further testing of TCMs would reveal the extent of the problem and make it easier for customs officials to identify the trade of endangered species. The increasing popularity of the medicines has seen the value of the industry increase to hundreds of millions of dollars per annum. "We found multiple samples that contained DNA from animals listed as trade-restricted according to the Convention on International Trade in Endangered Species Legislation. Put simply, these TCMs are not legal," Ms Coghlan said. Another concern is the mislabelling of TCMs, meaning consumers are unaware of the presence of some ingredients, including animal DNA and potential allergens such as soy or nuts. "A product labelled as 100 per cent Saiga antelope contained considerable quantities of goat and sheep DNA," Dr Bunce said. "Another product, Mongnan Tianbao pills, contained deer and cow DNA, the latter of which may violate some religious or cultural strictures." Incorrect labelling makes it difficult to enforce legislation and to prosecute cases of illegal trade. "It is hoped that this new approach to genetically audit medicinal products will bring about a new level of regulation to the area of complementary and alternative medicine," Dr Bunce said. "Auditing TCMs would assist in prosecuting individuals who seek to profit from the illegal trade in animal products." The Australian Customs and Border Protection Service and the International Wildlife Trade Section (Department of Sustainability, Environment, Water, Population and Communities) supplied the seized TCM samples that were tested in this research. Dr Bunce and his team plan to expand the use of these new DNA tests to evaluate other herbal medicines.